Wheelmen - Lance Armstrong, The Tour de France, and the Greatest Sports Conspiracy Ever is likely just the first of what will be a number of books covering the rise and fall of disgraced cyclist Lance Armstrong. At this point, many (if not most) in the cycling community are pretty much fed up with the Lance story, but, for those who aren't, this book is a necessary addition to their collection. Written by two investigative reporters for the Wall Street Journal - Reed Albergotti and Vanessa O'Connell - Wheelmen offers a fairly exhaustive review of Lance Armstrong's entry to the sport, his rise to fame and fall from grace. 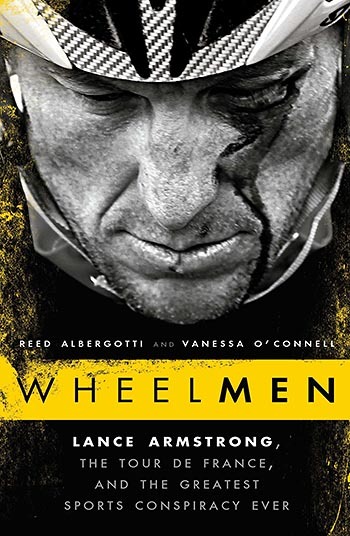 Pieced together from publicly available sources and interviews, plus documents and interviews given to the authors, Wheelmen provides a chronological look at Armstrong's life. Readers will see familiar details from Armstrong's own biographies, however, in this instance the rose-coloured glasses have been ripped off. The picture of Armstrong that emerges is of an egotistical, obsessed bully, who used and discarded people in his drive for success. This is not necessarily a huge surprise, since many of the 'best of the best' in sports, business and entertainment are no better. However, the difference with Lance Armstrong is that he held himself up as a beacon of hope for millions of cancer sufferers and their families. The book can be divided into roughly three parts - the early years of Armstrong's life up to his turning professional, his pro career and, finally, the unraveling of the systematic doping program he was a major participant in. If you are looking for shocking new revelations you may be disappointed, since most of the material here is in the public realm. What the book does do, however, is provide a comprehensive and, I would say, very balanced outline of a step-by-step and amoral decision to dope. I have no doubt that pretty much everyone else was 'doing it'; what sets apart Armstrong and his partners is the aggression and arrogance with which they both embraced doping and defended their actions. The book is strongest when it sticks to facts and figures; the meticulous detail and corroboration from others involved in the activities fills in many holes in the story that has come out from the USADA (United States Anti-doping Agency) Reasoned Decision which stripped Armstrong of his titles and resulted in the loss of sponsors and the lawsuits he faces. The authors recognize that only a recitation of facts would get very dull and attempt to fill out the book with speculation on Armstrong's motivation and emotional state during the course of events, but this is clearly not their forte, and it feels awkward. Ironically, Wheelmen helped reinforce my feeling that Armstrong was not the mastermind of a vast and diabolical conspiracy, which is exactly the opposite of what their 'Greatest Sports Conspiracy Ever' title proclaims. Rather, it points to a sport, industry, media and fans who obstinately refused to recognize a growing doping problem until it became unavoidable. Contact sports such as American football and hockey are now following the same path in their refusal to face the longterm effects of brain injury on athletes. Lance Armstrong was a symptom not a cause, and Wheelmen goes a long way towards explaining how and why cycling has developed such a dirty reputation.